On February 4, 2008, Forrest Church sent a letter to the members of his congregation, informing them that he had terminal cancer; his life would now likely be measured in months not years. In that remarkable letter, he wrote: “In more than one respect, I feel very lucky“; he went on to promise that he would sum up his thoughts on the topics that had been so pervasive in his work love and death in a final book. Church has been justly celebrated as a writer of American history, but his works of spiritual guidance have been especially valued for their insight and inspiration. As a minister, Church defined religion as “our human response to the dual reality of being alive and having to die.” The goal of life, he tells us “is to live in such a way that our lives will prove worth dying for.” This last book in his impressive oeuvre is imbued with ideas and exemplars for achieving that goal. The stories he offers-drawn from his own experiences and from the lives of his friends, family, and parishioners-are both engrossing and enlightening. 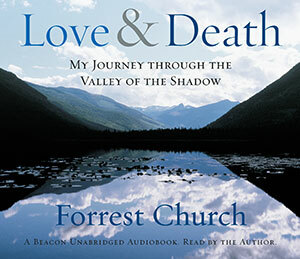 Forrest Church’s final work may be his most lasting gift to his readers.